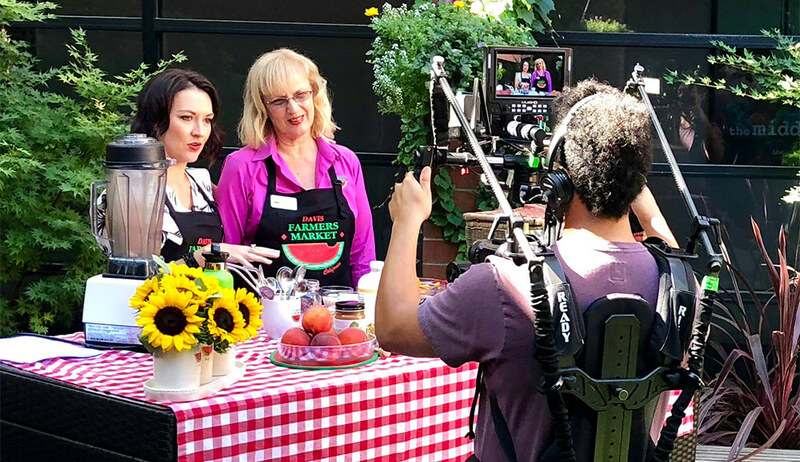 Market Manager Randii MacNear, center, appears on ABC10 in July 2018. To educate and engage the public about nutrition, sustainable agriculture, and the economic value to our area of buying locally grown food and locally sourced products directly from growers and artisans. In this effort, the Davis Farmers Market Alliance connects and supports communities, local agriculture, farmers and artisan food producers. The history of the Davis Farmers Market begins with the social awakening of the late 1960s and early 1970s, which set the stage for the establishment of alternative, local food systems. Since then, farmers’ markets, led by Davis, a college town in the Sacramento Valley, and by California, have exploded across the country. Today, there are more than 7,100 farmers’ markets nationwide – more than 700 of them in California. The Davis market, in the city’s Central Park, takes up about a third of a 5-acre park on Saturday mornings and more on Wednesday evenings during Picnic in the Park. It operates under a pavilion built with public funds, and it draws 7,000 to 10,000 people each week. These are my memories of how the Davis market, one of the first in California, came together in 1975 and 1976 through the work of a determined band of farmers, college students and others. It is also the story of how we took the market to the next level through the electoral process, and how it has become a new platform for educating the community through our local schools. The story of the market is in part my, Ann M. Evans’, story. I am a co-founder and have participated in its development over almost four decades. 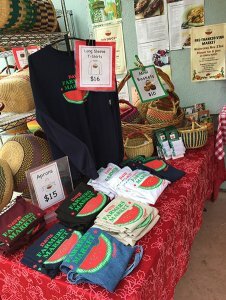 Today, the Davis Farmers Market runs two markets in Central Park, as well as the UC Davis Farmers Market and, since June 2011, the Sutter Davis Hospital Farmers Market. I served on the City Council that originated the master plan calling for a permanent home for the market, and I chaired the Davis Farmers Market Association board of directors, which established the Davis Farmers Market Foundation to fund school and community programs. Market co-founders Martin Barnes, Jeff and Annie Main, Henry Esbenshade and I were all students at UC Davis in the late 1960s and early 1970s. We came together through friendship, political activism, the Agrarian Effort, the founding of the Davis Food Cooperative, and a shared mentorship under UC Davis rural sociologist Isao Fujimoto and his Alternatives in Agricultural Research Project. Berkeley’s Free Speech Movement took place in 1968, and the first Earth Day followed in 1970. Those heady days spawned societal change across the nation. In 1972, Davis had the first election in the state in which students could vote in their campus community, and a new majority was elected to the Davis City Council. Former UC Davis associated student body president Bob Black, Joan Poulos and Maynard Skinner took office. Black had run on a progressive platform calling for a new bus system and a farmers’ market. Laurie Hammond and Phil Kitchen, the managers of the first market, worked hard with others to establish the market in Central Park, but it failed in its second year. That failure would provide many lessons for the next attempt to build a market. In 1976, with a bachelor’s degree in consumer food science in hand, I went to work for then-Gov. Jerry Brown’s Department of Consumer Affairs, where I focused on starting food cooperatives in “food deserts,” on establishing community canneries statewide; and on launching direct-marketing experiments with state prisons to purchase produce from area farms. I also joined with consumer representatives from around the state to link cooperative movements with direct marketing and farmers’ markets. In that same year, Henry Esbenshade, Martin Barnes and Annie Main secured approval from the Davis City Council to open the Davis Farmers Market in Central Park. Emboldened by the Davis Food Cooperative’s promise to buy anything that the farmers couldn’t sell, the Mains scoured the county for farmers willing to sell their goods. In December, co-op enthusiasts moved the Davis Food Cooperative buying club (300 households strong) into its first storefront. Soon after, Martin, Henry and Annie set up their own farms, eventually becoming Capay Organic, Everything Under the Sun, and Good Humus, respectively, all of which continue to sell at the Davis Farmers Market. Meanwhile, consumers and new organic farmers began lobbying to change state regulations that restricted farmers’ markets and other forms of direct marketing of food. The state Department of Food and Agriculture adopted regulations creating the nation’s first certified farmers’ markets. Finally, as long as their products met minimum quality standards and were sold in a market certified by the county agricultural commissioner, farmers could sell their products directly to consumers without meeting the usual size, standard pack and container requirements. Davis Farmers Market board member Les Portello was among those who helped execute the program. Over the next decade or so, organic and other small-scale farming grew, as demand swelled for what these new farmers produced. Growth was fueled by people such as Sibella Kraus, first of Chez Panisse and then of Greenleaf Produce, and Georgeanne Brennan and Charlotte Kimball, who founded Le Marché Seeds in 1980. They were responsible for introducing many of the European varieties, such as red romaine, arugula, Chioggia beets and Lacinato kale. Pioneer market growers from around the nation contacted them to learn what was newly imported. Among them were growers who were selling at the Davis Farmers Market. Although the market had grown from just three farmers with boxes of produce on the ground, some eggs, and loaves of bread, to a thriving marketplace with a steadily growing number of vendors, and fruit and vegetable cultivars, it was still temporary in the minds of many. Successive market managers, including Annie Main, Solomon Teklu, John Poorbaugh and Randii MacNear, did the best they could, but it took Randii on her second stint as manager (now more than 30 years) and a vote of the Davis electorate to take the market to the next level: an expanded Central Park and a market pavilion. Originally constructed in 1937, Central Park (between Fourth and Fifth, and B and C streets) is the city’s oldest park. The old Lincoln Highway once ran along the park’s west side, now B Street, and from 1918 through 1966, the Davis Elementary School stood on the square block next to it. When the school came down, the square block became a gravel parking lot, which it remained until 1986, and ultimately 1990, though not for lack of development efforts. I like to say the land had a will of its own, and I’m sure without that divine intervention, the market would not be what it is today. In this next phase of development, public funding and public policy switched to center stage. Known as the Arden Mayfair site after a grocery store that was never built, the square block came under city ownership in the 1970s. The purchase, which cost in excess of $1 million, occurred during Bob Black’s tenure on the City Council, and was made possible with funds secured through federal revenue sharing. In retrospect, Bob Black sees this as a key development in the establishment of the farmers’ market, as it kept the space under public control. My council (1982 to 1990, mayor 1984 to 1986) proposed development of the land in 1984, as a means of strengthening the city’s economic base. Former mayor Maynard Skinner led a campaign, Save Open Space, to block that plan. SOS received a 58 percent majority vote at the ballot box. The council then issued an invitation to design and architecture firms to submit proposals to develop the park extension’s master plan. The plan included closing Fourth Street and grassing it over to connect Arden Mayfair to Central Park, making one two-block-long park; constructing a market pavilion to protect vendors and customers from the rain (the first such pavilion in California); and other amenities. Everyone loves the park and pavilion today, but back then, the final vote was 3-2. CoDesign, a local architectural firm founded by landscape architect Mark Francis and architect Jim Zanetto, won the competition to design the park and pavilion, and drew up the master plan with input from the community. The plan was implemented over three phases, from 1988 through 1994, and won national awards. In 1990, Phase I was completed. In 1991, the teen center opened (now the U.S. Bicycling Hall of Fame museum). In 1992, the Davis library building, originally constructed on F Street in 1911, was moved and renovated to become the Hattie Weber Museum of city history. In 1994, Phase 2 of the Central Park expansion opened and included the now-famous Farmers Market Pavilion, as well as new children’s play areas, a water basin art piece, and a water fountain plaza. At long last, the ambiance the growers had dreamed of had been achieved. The pavilion gave everyone a feeling of permanence. For farmers like Jeff and Annie Main of Good Humus, who rely on farmers’ markets for their primary income, it was an enormous personal relief. Where did the money come from to build out the master plan? It was not included in the SOS initiative, so it fell to my council to find it. Tax increment funding from the recently formed Davis Redevelopment Agency was our answer. In seeking to fulfill a campaign promise to build more affordable, cooperative housing, I learned from then-state Assemblyman Tom Hannigan (D-Fairfield) about the tax increment provided through state redevelopment agencies. After heated debate, the council formed the Davis Redevelopment Agency and put the core area, including the park, inside the area eligible for funding. Today, market shoppers take heart as they watch hundreds of children enjoying the adjacent play equipment. Another favorite of the children is the old-fashioned pedal-powered carousel, which was funded by the community. In 1995, the Davis Educational Foundation (predecessor to today’s Davis Farmers Market Foundation) put The Flying Carousel of the Delta Breeze on the north side of the park. Designed by fifth-generation carousel builder William Dentzel, the community painted the beloved flying horses, pigs and other magical animals. The carousel, overseen by the market, raises funds for school classrooms that sign up to run it for a day, giving them any profits earned during their tenure. This connection between the Davis schools and the market is stronger than ever, and provides a context for future development. In 2005, I renewed my role with the market by serving on its board of directors. Randii and I agreed that the association needed a tax-exempt public educational foundation, and we knew the one we wanted. The two of us, with the Davis Farm to School Connection steering committee members, under the leadership of Dorothy Peterson, helped the school district add a farmers’ market salad bar to its school lunch program in 2001. Conversely, the farm to school group had raised funds for improving recycling at the Davis Farmers Market to mirror a program in the schools. 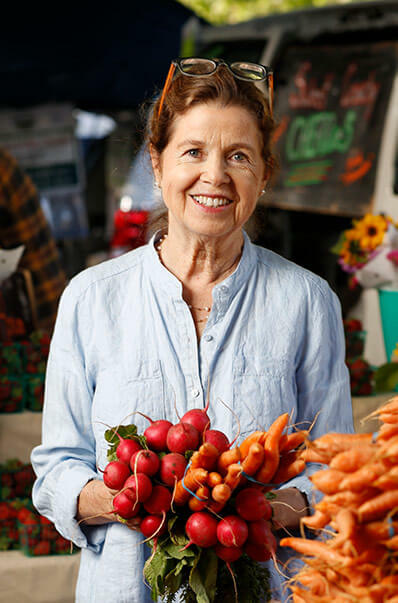 The relationship had worked well, and in 2007, the Davis Educational Foundation became the market’s foundation, renamed the Davis Farmers Market Foundation, and Dorothy Peterson became its chair. The market now had a formal way to receive funds for educational programming in the schools and the community. The market has stayed true to its local roots. More than 70 percent of the vendors come from a one-hour hour drive of the market, and 50 percent stay year-round. The festivals, such as the Fall Festival, and the Village Feast (the latter raises funds for farm-fresh food in the schools), are complemented by Picnic in the Park, which is weekly, spring through fall. This popular evening event offers the public a free space to socialize and picnic, with a basket from home or prepared food from a market vendor, and to listen to live music and shop for produce. The improved educational gardens on the west side (another foundation project) and the market chefs who prepare signature dishes also contribute to the market’s success. Sellers with compelling stories, visitors from all over the world, and multigenerational family shoppers create the weekly warp and weft of the market fabric. But perhaps my friend and market co-founder Annie Main, who has been doing the market for more than 35 years, says it best. She, like her fellow sellers, sees the market from the other side. People held her children when they were babies, and her adult children now sell at the market as a part of Good Humus. She told me that you see many people’s lives walk by every Saturday. For example, you notice who gets divorced and who gets married. You also notice who no longer appears, and you wonder where they have gone. Have they moved, died or just lost interest? Part of the job she and other vendors take on goes beyond selling: it includes a relationship with their customers. Longtime market manager Randii MacNear says the market mirrors the values of the community, which is why it works. At the heart of those values is preserving assets for the generations to come. The last big chunk of the infrastructure went in at the south end of the market in 2000. Like the carousel, it came about through private funding. Known as the Marie Whitcombe Plaza, it was named after Marie Louise (Olsson) Whitcombe, who sold honey at the market in the early days. Local artist Susan Shelton created a ceramic mural with bees and other market symbols for the dedication and permanent commemoration of the plaza. The late Whitcombe, whose children have sold melons and corn at the market and who donated the funding for these south-side improvements in her honor, is also, like so many market family and friends throughout town, an indelible part of the market’s story. 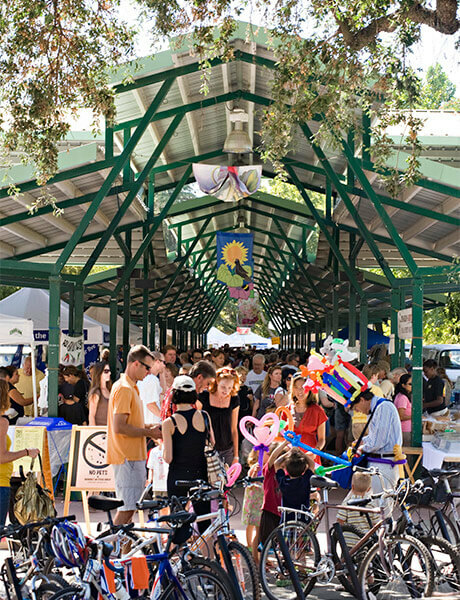 The market in Davis could be a market in any town where the public good is put to the use of the people, where the surrounding soil is fertile and worked, and where people of different faiths and purposes on the planet are willing to slow down, gather together, and shop while they swap the news.